Happy Monday and welcome to a new Merry Monday Christmas Card challenge! 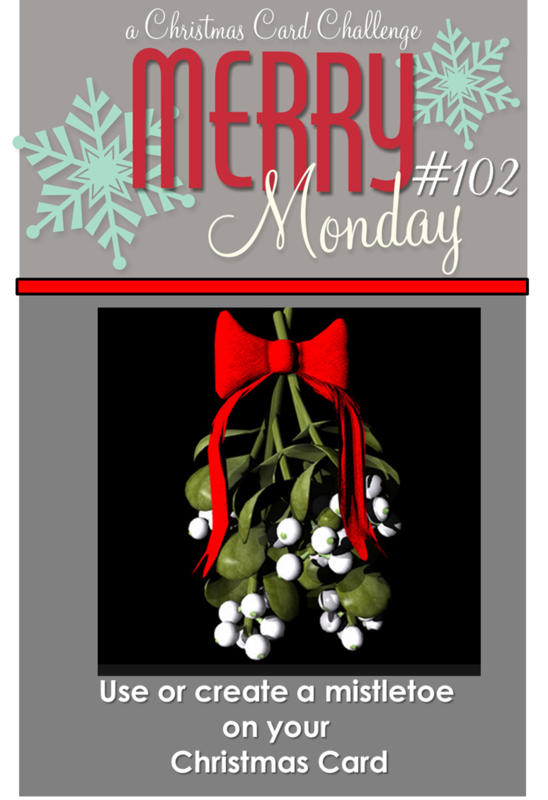 This week it's time for some "Christmas Kisses" because we invite you to create a Christmas card with mistletoe on it!! Stop on over to the challenge blog to see the lovely cards the Design Team has to share with you! I just love your embossing Kathy and that little gingham bow is SO pretty!!!! So stunning, Kathy! I love the embossing that frames the main image! Love the bow too!!! Kathy this card has a lovely classic feel to it. Just beautiful and simple! This is so pretty, Kathy!! 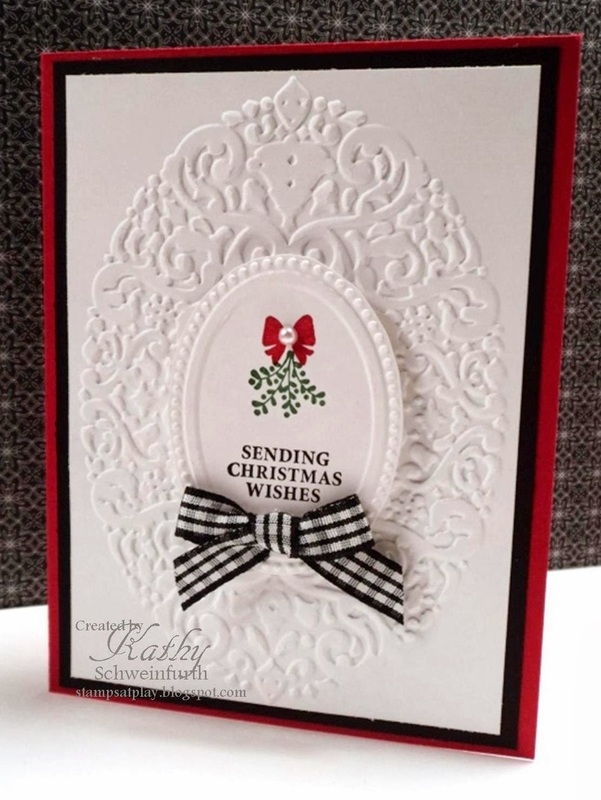 I love that embossed panel and that cute little mistletoe/bow stamp is so adorable! WTG! So pretty and elegant Kathy. Love the dry embossed oval... it's the perfect backdrop to the small oval. What wonderful white space, Kathy! And that black gingham bow is the perfect way to finish it off! Gorgeous! What a gorgeous embossed frame Kathy, it really sets off the lovely wee centre panel. Love the gingham bow too. So clean and fresh. Kathy, so stunning. Love the embossing. Actually love everything about it. This is gorgeous, Kathy! I love all the white space with the little pops of color. And the dry embossing is a fantastic frame! This is one of my favorite embossing folders. Wish it would have stuck around longer. Very pretty with all the white space! Beautiful and so elegant Kathy, I love all that texture. Such an elegant card. You made a great card out of such a small mistletoe stamp. It makes a big impact. Gorgeous card, Kathy! I love how you've showcased your mistletoe with the embossed oval frame!